CRP normal ranges for adult male and female in healthy stable state, as well as acceptable CRP normal range for children, newborn infants, and pregnant women. Normal ranges is for quantitative plasma c-reactive protein blood test according to many scientific studies and laboratory observations in many related diseases. Healthy individuals have 0.0 to 0.8 mg/dl normal CRP range or CRP not detected in blood test, CRP normal range for suspected RA or heart diseases is 1.0 – 6.0 mg/dl, CRP range over 10 mg/dl is considered high, and indicate Acute or chronic inflammation. Normal Hs CRP range for low cardiovascular disease is 0.0 – 1.0 mg/dl, 1.0 and 3.0 mg/L of Hs-CRP is the normal range seen in early average risk for heart disease, Hs-CRP range over 3.0 mg/dl tells a high risk for cardiovascular disease especially with increasing values. CRP normal range after RA treatment is below 6.0 mg/dl or when CRP values decreasing over treatment course, higher crp may indicate remission or treatment failure. CRP normal range in infants (healthy full-term and preterm) is from 2 to 5 mg/L during the first few days of life, During the neonatal period upper normal CRP level of 10 mg/L has been identified in many cases. Higher CRP values in infants means sepsis with the help of other tests results. CRP normal range in pregnancy is from 1.5 – 2.5 mg/dl as observed by many researcher’s studies. CRP normal reference go high in the second half of pregnancy or if woman is on birth control pills. Studies suggest that very high CRP levels in early pregnancy are associated with preterm delivery. 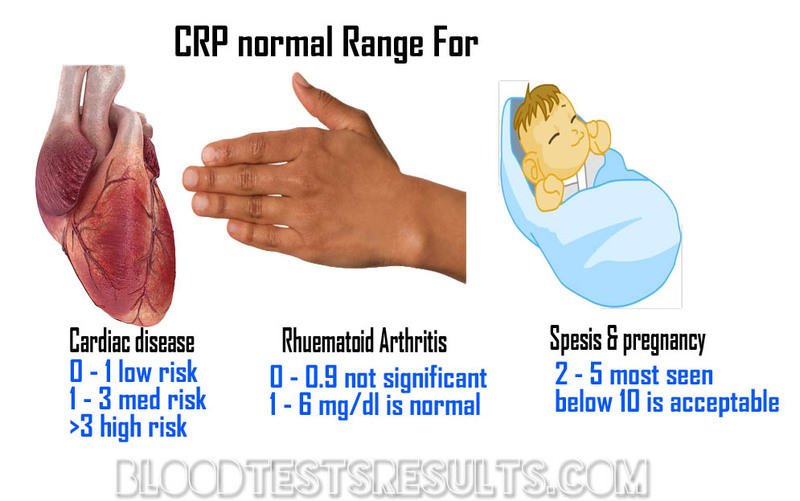 CRP is not an independent marker for inflammatory disorders in humans, CRP blood test is a part screening tests include sed rate test, RF, anti-CCP, FBC, ASOT, cardiac enzymes, blood cultures.